Tonight on CBS their drama Bull inspired by Dr. Phil McGraw airs with an all-new Monday, October 08, 2018, episode and we have your Bull recap below. On tonight’s Bull season 3 episode 3 as per the CBS synopsis, “Bull and the TAC team are at the center of a federal civil suit dividing the city when they consult for the NYPD on the defense of a police officer accused of excessive force in the shooting of an unarmed man. A female officer on duty heads into a restroom at a restaurant to use the bathroom. Her male partner waits in the cruiser. She can’t lock the door so she puts the garbage can in front of it. A drunk man comes in and heads towards the sink where her gun is. She rushes to grab it and they have an altercation. She shoots. He goes down. Out to dinner with the police commissioner, Bull and Scott talk about the incident. The man was a second-grade black teacher who rushed to the bathroom because he had a few too many. The commissioner is being sued by him and he wants Bull’s help. His officer did what she had to and it wasn’t about race. Now the officer is hated throughout the city. Bull goes with Scott to meet the officer Tanya who has protesters outside her house. She refuses to leave. Bull talks to her alone. She tells him this is all her fault. Bull tells her not to say that allowed. She admits she is upset she hurt that man and she is disgusted with herself. Bull thinks they should try to settle this before it goes to court. Back at the office, Benny and Danni dispute over the case. Danni thinks the cop is wrong. Benny thinks she is right. Meanwhile, Bull sits in a conference room with a large arrangement of food. He wants to eat it but pushes it away. He meets with the man’s attorney. She wants $25 million for her client. Bull reminds her that the man suffered a flesh wound. She thinks if her client was white he wouldn’t have been shot. She isn’t looking to settle. They are going to court. 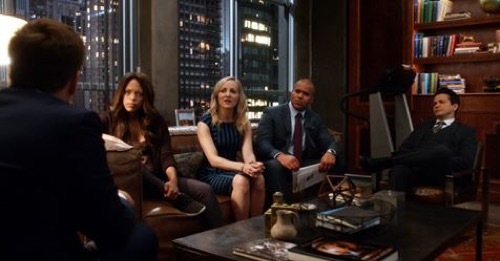 Bull meets with the team and tells them they are going to trial tomorrow. He wants them to find a jury pool that would react in a blink like Tanya. The next day at court, Benny works to find the jury pool they need. Chunk and his daughter talk after school. She is mad he is defending Tanya. He tells her that justice needs to be colorblind and it is important that he would a part of the fact-finding process. Danni tracks down a woman who was involved with the victim, Cal, who was shot. Cal takes the stand. He details how he had too much to drink at ran into a diner to get sick in the bathroom. He saw a woman but needed to get to the sink. He grabbed the barrel of the gun out of instinct. Benny questions Cal. The toxicity report says he was on molly that night. He denies it. Benny also points out that a year prior Cal was accused of sexually harassing a woman who he was driving during his part-time job. He explains that the whole thing was a misunderstanding. They take a recess. Bull urges the commissioner to consider settling once again now that they have leverage, but he declines. Chunk meets with Tanya to prep her. He questions her on the stand like Cal’s attorney will. It is intense. They take a break. On the stand the next day, Tanya is questioned about what Cal was wearing. The alarms go off. There is a bomb threat. Bull tells Tanya he is concerned for her. She says she will be fine. On the stand, Tanya breaks under pressure when she says she grabbed her gun because a man broke into the ladies room, a black man, and doing her job for so long she grabbed for her gun. The courtroom goes wild. Bull meets with the team and they talk. They are in a lot of trouble and the commissioner wants them to settle. They get to talking. Cal never did throw up anywhere did he? The next day, Benny questions Cal on the stand. Did he purposely get drunk and high in order to take a shot? The court goes wild. Benny knows Tanya and Cal have been romantic for months. In fact, he has the motel clerk from where they have been visiting. They confess to plotting the whole thing for money. The court is angry. After, Bull hits it off with Cal’s attorney who tells him she plans to call him sometime.